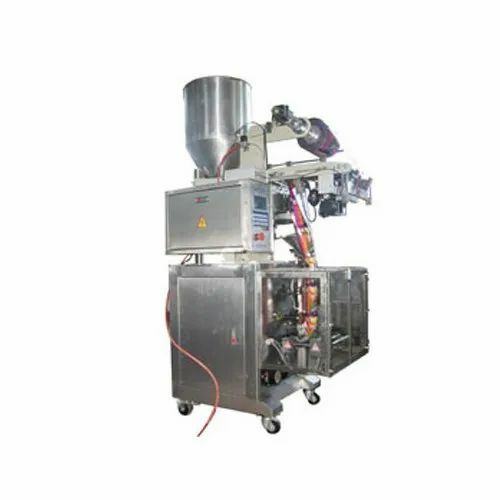 A low cost no-frills automatic vertical form fill seal sachet packaging machine (FFS machine) suitable for packing free-flowing powders/granules/snack foods in single-use sachets for food service, pharmaceutical, contract packing and other industries. APPLICATIONSThis machine is ideal for producing pillow-pack bags of lightweight snack foods such as pop-corn, cheese balls, extruded snacks, banana chips, pretzels, savories, etc with or without gas filling, in the 15 grams to 50 grams packed weight range. The FFS-388 is controlled by a double SCM (single chip) system and with a large LCD. There is a clear man-machine interface that can be easily understood. Provisions are made in the machine for intelligent protection to maximize the yield and reduce wastage while maintaining machine stability. The machine will automatically stop functioning and display the failure information in the event of temperature control failure, heater burn-out failure, photo-electric failure or even when the machine runs out of film. All these advanced features make the machine very stable and easy to use, thus resulting in high yield and low wastage at a very attractive cost. OUTSTANDING FEATURES # Full epoxy coated rust resistant body. (Optional FULL STAINLESS STEEL BODY)	# All contact parts like the forming tube, product hopper (reservoir), volumetric filler and measuring cups executed in aisi 304 stainless steel. # Hot foil printing unit for imprinting expiry date, batch number on each individual pouch. # Option for nitrogen flushing of each individual pouch, for high sanitization. # Settings for temperature, length, counter, photo-electric unit, heating, as well as machine commands like Mix, Move, and run or Stop operated by light press keys. # Microcomputer (SCM) Controller with a 115 mm x 64 mm LCD ENGLISH Display with a simple and easy to understand Man-Machine Interface # Spares available on demand at reasonable prices. Technical support available around the year, around the clock! # Accurate filling and easy weight adjustment with a high precision volumetric cup filler. # Runs on a regular 220V AC single phase power supply. Can be ordered with an optional step up transformer for countries with 110V AC power supply. # Machine LCD will show the error message for all problems encountered during operation for easy identification by the operator. # Electrical & mechanical protections available for compliance with accepted safety standards. Started in 1993, Sikri Packaging Corporation LLP has in these years developed a sound reputation as one of India's most reliable exporters of quality tea bag packaging machines the world over. With our stress on delivering quality products and quality services, our growing list of blue-chip clients have favoured us with their repeat business year after year. We are manufacturers, exporters and suppliers of Fully Automatic Single Chamber Tea bag Machines, Pyramid Tea Bag Machines, Weigh Fillers, Band Sealers, Tea Bag Paper, Tea Bag Outer Envelopes, Tea Bag Tag Paper, etc. and many more.